Rep. Tulsi Gabbard (D-HI) has drawn attention in recent weeks for leading a delegation to Syria and Lebanon, where she reportedly met with government leaders, refugees, and members of civil society. The stated purposes were to engage in fact-finding and promote an end to the Syrian war, but details about the trip have raised questions about its wisdom and legality. In this post, I’ll elaborate on the relevant legal issues and supplement the news coverage by offering additional context for what’s taken place. I just posted the final, published version of my paper Finding Customary International Law, which came out in the Iowa Law Review last month. It’s available here. One of the big takeaways from the South China Sea arbitration is that the high-tide features in the Spratly Islands are mere “rocks” under Article 121(3) of the UN Convention on the Law of the Sea because they “cannot sustain human habitation or economic life of their own.” This means that even the largest islands within the group lack an exclusive economic zone and a continental shelf. It also means that the separate question of sovereignty over the islands themselves is suddenly much less consequential than it might have been: whoever has title over the land now enjoys a diminished package of maritime rights that spatially extend no farther than a 12-nautical-mile territorial sea and an additional 12-nautical-mile contiguous zone. This outcome is not only significant for the South China Sea; it also suggests something about the status of disputed features in the East China Sea: the Senkaku Islands. Simply put, the UNCLOS tribunal’s exposition and application of 121(3) strongly suggest that the Senkaku Islands are rocks. This is a setback for Japan, which has the superior claim to title, but might help to deescalate tensions between China and Japan by substantially reducing their legal incentives to contest each other’s claim. I’ll start with 121(3)’s text: “Rocks which cannot sustain human habitation or economic life of their own shall have no exclusive economic zone or continental shelf.” Due to a lack of precedent and divergent commentary, there’s been quite a bit of uncertainty about the meaning of this language. The tribunal, however, resolved much of it in favor of treating close cases as rocks. This evidence clearly suggests a capacity to sustain certain forms of human presence and economic activity. The tribunal, however, designated Itu Aba as a rock by narrowly interpreting 121(3)’s key terms. Second was the phrase “economic life of their own.” The tribunal explained that “economic life” means “more than the mere presence of resources,” and that “some level of local human activity to exploit, develop, and distribute those resources would be required.” “Of their own” in turn means that the feature(s) “must have the ability to support an independent economic life, without relying predominantly on the infusion of outside resources or serving purely as an object for extraction activities, without the involvement of a local population.” Itu Aba failed to meet these standards, too. Although the island supported certain kinds of economic activity, all of it was “essentially extractive in nature (i.e., mining for guano, collecting shells, and fishing)” in the sense that it “aimed to a greater or lesser degree at utilizing the resources [present] for the benefit of” populations elsewhere. This was inadequate. A number of commentators, myself included, have characterized the Senkaku Islands as fully entitled islands rather than rocks. But that position now appears untenable. Indeed, there are several ways in which the Senkakus, even as a group, present a similar or even easier case for rock status than Itu Aba. Consider the following timeline, which I pieced together from archival materials and an academic article that the Japanese Ministry of Foreign Affairs recently highlighted as presenting an accurate account of the islands’ history: Prior to the late 1800s, there was essentially no human presence of any kind. In 1890, a Japanese company placed roughly 80 fishermen on the largest of the islands (Uotsuri) to build huts and collect shells and other marine resources, but these individuals were present at most “for seasonal periods.” Other groups of fishermen also stayed on the islands intermittently, but only “for two to three months at a time, or at the longest half a year” because the “environment wasn’t suitable for longer stays.” In 1893, a group of workers stranded on Uotsuri managed to survive for an unspecified period. The food they consumed, however, was non-native, and they were “almost at the end of their endurance” when they were finally “rescued.” In 1896, the Japanese government leased some of the Senkakus to an Okinawan entrepreneur who used them and the surrounding waters as a source of albatross feathers, terns, bonito, and guano, all of which he sold in Japan or exported for profit. At the peak of these operations around 1912, there were 248 people present, but these individuals were “hired—not so much as pioneers to develop new territory than as migrant labor employed to do a certain job,” and they “received payment in return for agreeing to live and work on the islands” only “for a certain period of time, normally a year or six months.” And although the entrepreneur constructed dorms, warehouses, work huts, and a boat-building dock to support his operations, there were “no personally owned houses” present. Since the expiration of the lease, no one has lived on the islands even temporarily, and they are uninhabited today. Much of this sounds similar to Itu Aba. Neither appears to have a naturally occurring supply of food, water, or shelter in quantities sufficient to enable a group of persons to live for an indeterminate period of time. Neither has ever had a stable community of residents who considered the island their home. Neither has sustained economic activities that are anything other than extractive. Uotsuri is slightly larger than Itu Aba, but the tribunal emphasized that size per se is irrelevant. There appears to be an abundance of resources around the Senkaku Islands, but the same could be said of Itu Aba. Given that Itu Aba is a rock, it is highly likely that the Senkakus are as well. This strikes me as a major development in its own right. China and Japan have contested sovereignty over the Senkakus in part because of the marine resources surrounding and the hydrocarbons reportedly lying beneath the islands. If sovereignty is unlikely to carry with it an exclusive economic zone or rights to the continental shelf, then the parties simply have less incentive to contest title in the first place. This should be a welcome development for the international community, especially third parties that might be drawn into the dispute if it ever degenerates into open hostilities. But it also means that the tribunal’s ruling is a double-edged sword for Japan, which, in the view of most American legal commentators, has the stronger claim to sovereignty. Tokyo has already called upon China to comply with the UNCLOS ruling and would benefit in various ways if Beijing were to oblige, but this very same ruling has substantially bolstered the argument for downgrading the extent of Japan’s legal entitlements in the East China Sea. How Japan responds will be an issue worth following. This Article offers an empirical answer to a question of interest among scholars of comparative international law: why do American views about international law appear at times to differ from those of other countries? We contend that part of the answer lies in legal education. Conducting a survey of the educational and professional backgrounds of nearly 150 legal academics, we reveal evidence that professors of international law in the United States often lack significant foreign legal experience, particularly outside of the West. Sociological research suggests that this tendency leads professors to teach international law from predominantly national and Western perspectives, and thus socialize generations of future government elites, activists, legal experts, and private practitioners to internalize views about “international law” that are not always truly international. After discussing and analyzing the new evidence, the Article identifies arguments for and against the current pattern. The piece is forthcoming in the Michigan Journal of International Law and available here. I recently posted a draft of a new article on international legal education. The article examines the curriculum of virtually every law school in the world in order to identify global trends in the teaching of international law, and then theorizes on the significance of the findings. It’s forthcoming in the Indiana Law Journal and available here. Recently I returned from a trip to Cuba, where I had the opportunity to interview Celeste Pino Canales, a highly regarded professor of public international law at the University of Havana. I pursued the interview for a couple of reasons. First, I wanted to get a sense for what it’s like to be an international law professor in Cuba. Second, given renewed interest in the field of comparative international law, I wanted to investigate whether there might be distinctive Cuban perspectives on topics such as treaty law and custom. 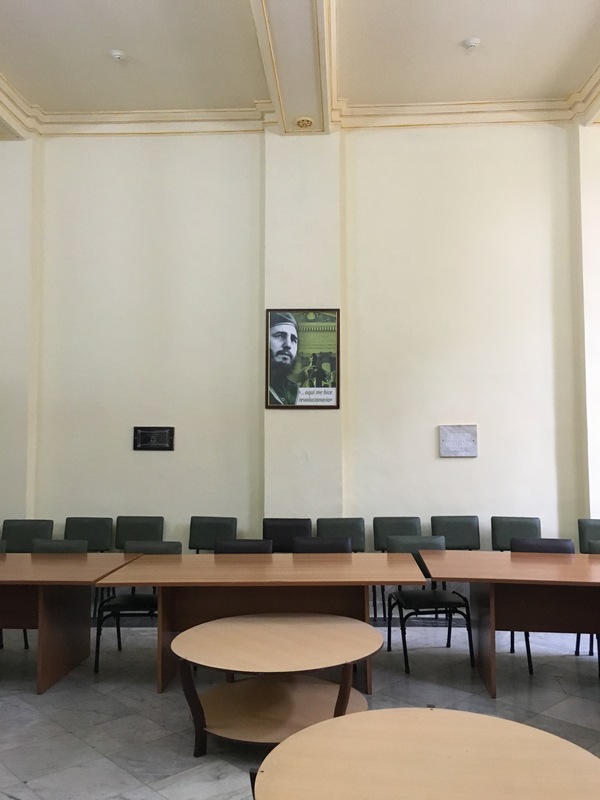 The setting was the University of Havana Law School, where the classrooms have framed photographs of a rugged, youthful Fidel and inscriptions like “This is where I became a revolutionary.” Professor Pino Canales and I spoke with the help of a translator, so it’s possible that I missed certain nuances, but she made a number of points that seem worth sharing. We began by talking about her work, which is both identical to and different from that of legal academics in the United States. I’ll focus on some of the principal differences: Imagine being a professor whose field is international law, but who cannot travel abroad for conferences, use the internet for research, or follow major foreign news sources. How would you track the latest developments in your field, conduct research, and connect with foreign colleagues? These are the conditions and questions that appear to confront professors of international law in Cuba. Pino Canales and others like her are unable to travel abroad for conferences and other professional opportunities. Although it was unclear whether this is due to limited finances or government restrictions, the consequence is that Cuban academics tend to have exceedingly limited contact with their overseas counterparts. Pino Canales has managed to develop relationships with Bolivian, Venezuelan, Costa Rican, and some African scholars, but only because those individuals traveled to Havana for conferences and presentations. To me, the composition of that group was striking not only because it suggested the existence of a network of scholars with whom most in the West have no interaction, but also because it revealed a general absence of intellectual exchange with Americans in particular. Worlds were colliding as we spoke, in fabulous and disorienting ways. As for research, the resources simply aren’t there. One problem is that most publications on international law are written in languages other than Spanish. Cubans study English in grade school, but my impression was that most people, including scholars, lack the aptitude to read legal scholarship in English, and that most universities do not have the capacity to systematically translate publications into Spanish. Equally significant, international law professors cannot access most non-Cuban scholarship. All faculty and students at the University of Havana reportedly share a single internet account with bandwidth equivalent to that of one residential account in the United States, so it takes forever even to visit the website of the United Nations, let alone download documents, and the American embargo has further complicated research by blocking downloads of online U.S. publications. To obtain books and articles from abroad, Pino Canales must typically wait for foreign academics to visit, network with them once they arrive, and then request that they physically mail hard copies to her once they return home. These conditions seem noteworthy for a couple of reasons. 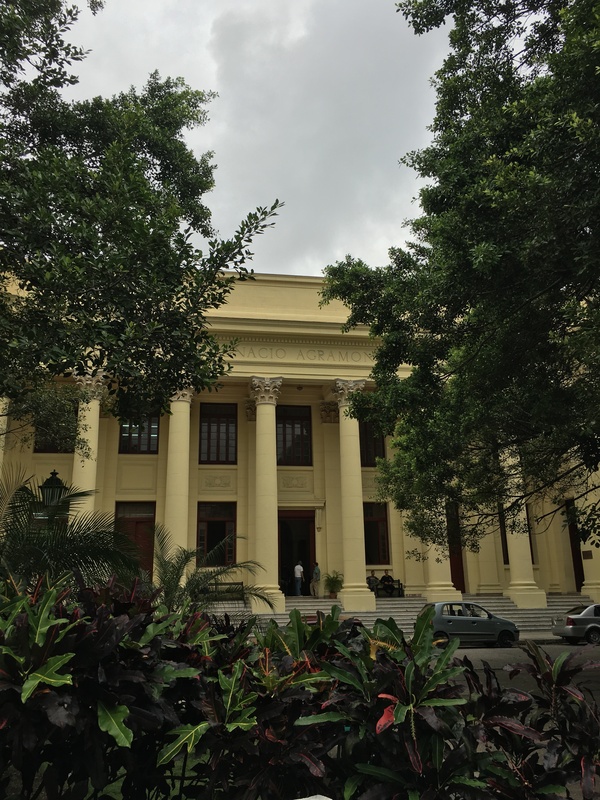 First, they make it difficult for Cuban scholars to participate in the “invisible college of international lawyers.” Working in substantial isolation and with limited means, professors find it a challenge to follow the latest developments in the field, exchange ideas, and contribute. Much of this is probably old news to those who are more knowledgeable about the country, but I think it’s a useful reference point for American scholars who are accustomed to the luxuries of substantial travel budgets, unlimited internet access, massive electronic databases of legal authorities, a large community of colleagues, and an abundance of publications and conferences in English. These are the practical manifestations of the happenstance of presence in the global core. The Cuban experience suggests that to be an international law scholar without these resources is to be relegated to the status of an intermittent observer of a semi-global conversation, rather than an active participant, and that poverty and political differences stand as major obstacles to the creation of a fully inclusive community of international lawyers. Second, the professional isolation of those who hold influence over Cuban understandings of international law might in turn foster the development of distinctive national perspectives about the field. As an illustration, the primary Cuban textbook on public international law has Cuban authors, most of whom received their legal training from domestic schools, and cites mostly to legal and academic sources from the 1960s and 1970s, only a small portion of which are American or European. Do Cuban law graduates develop unique or, to the American mind, antiquated views about international law in learning from this sort of text? Quite plausibly, yes. And given that international law requires a certain cross-national harmonization of understandings and attitudes, those who support the idea of effective global norms might fairly view the conditions in Cuba with concern. All that said, I think the recent steps toward rapprochement could help to mitigate these problems. For example, new federal regulations authorize on a case-by-case basis the export of “items for . . . education” to “meet the needs of the Cuban people.” This reform appears to make it easier for American scholars to share international law casebooks and articles with Cuban colleagues. Likewise, although the Treasury Department has for years allowed travel for certain “educational activities,” expanding transportation and communication links between the two countries will likely make it easier for American scholars to visit for research on international law and to develop and maintain contacts with Cuban colleagues. As one illustration of the potential payoffs of this sort of endeavor, I was able to obtain from Professor Pino Canales a copy of the main Cuban textbook on public international law, which I hope to translate and share with American scholars in the near future. These sorts of activities will make it easier to appreciate differences in perspective and help to generate mutual understanding. What, then, are Cuban perspectives on international law? I wasn’t able to explore this question as much as I’d hoped, and I don’t know whether Pino Canales’s views are representative, but a few points were clear. First, she seemed skeptical about international law’s claim to legal status. She stated, for example, that the field “is more about politics than law,” and she suggested quite firmly that just as there is “no such thing as a half-pregnant woman,” there is no such thing as soft law—law is either formally binding or not law at all. I had always assumed that Cuba would promote expansive concepts of international law as a strategy to try to constrain its powerful neighbor, so these positions struck me as surprisingly realist and Austinian. Second, Pino Canales was critical of developed countries for trying to use international law to impose on the rest of the world a “democratic, liberal, and bourgeois” model of society that lacks universal resonance. She expressed skepticism about market liberalization and characterized it as a mechanism by which the powerful reinforce existing global hierarchies. Finally, although not necessarily issues of international law, Pino Canales explained that Cuba maintains four non-negotiable demands notwithstanding the recent developments in its relationship with the United States. First, Washington must respect Cuba’s sovereignty and the self-determination of its people by removing the embargo, which she described as “fundamentally illegal.” In her view, the recent reforms from the Obama Administration simply aren’t enough. Second, the United States must rescind the Cuban Adjustment Act, which incentivizes a destabilizing exodus of young people to the United States by making it easy for them to become permanent residents upon arrival. Third, the U.S. government must terminate Radio y Television Marti, a federally financed broadcaster that transmits reformist, Western programs in Spanish to Cuba. And fourth, Pino Canales stated that the United States must relinquish control over Guantanamo. She argued that the lease can’t be held in perpetuity, and that the international law doctrine of rebus sic stantibus renders unenforceable the provisions of the 1903 treaty that granted the United States “complete jurisdiction and control” over the land where the military base is located. Assuming that these positions represent the views of her government, it will likely take a lot more than removal of the embargo to develop an amicable relationship. The optimistic view is that American scholars might have a small role to play in that process. 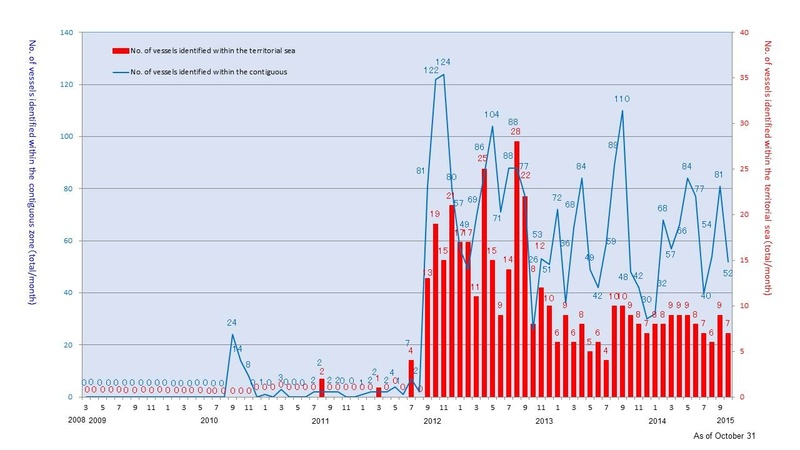 I see two noteworthy trends: first, an ongoing pattern of significant fluctuation in the monthly volume of incursions into the contiguous zone, and second, stabilization of entries into the territorial sea at an average of eight per month, which is down quite a bit from the highs of 2012. If you’re Japan, these patterns remain troubling, but the numbers concerning the territorial sea suggest that China may have settled on a strategy of stalemate, at least for the time being.